Tomato poha is made with flattened rice, tomatoes and spices. This can be had for breakfast, dinner or even as an evening snack with tea. This dish does not need much ingredients and can be made in just 15-20 minutes. 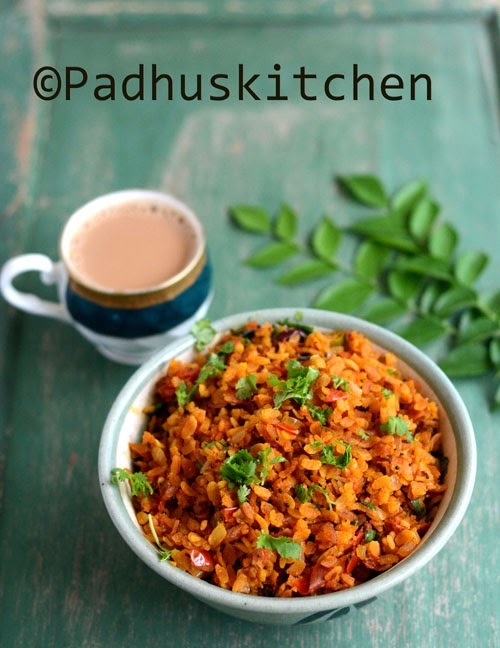 Today let us see how to make this quick and easy tomato poha following our easy recipe with step wise pictures and video. Chop onion, tomatoes and green chillies and keep it ready. There are two varieties of poha/aval. One is the thick variety and another is the thin variety. You can use any poha for this recipe. I have used thick red poha for this recipe. It is made from red rice. For thin poha - Wash and rinse poha 3 times and then drain it in a colander. No need to soak. For thick poha - Wash and rinse poha 2 times and then soak it for 2 minutes. Then drain the water in a colander. After few minutes, fluff it with a fork and keep it ready. Heat oil in a pan, add mustard seeds, cumin seeds, hing and red chillies. When mustard and cumin seeds sizzles, add chopped onions, green chilli and curry leaves. Add chopped tomatoes, turmeric powder, chilli powder, coriander powder and salt needed. Cook until tomatoes become mushy and the rawness of the tomato goes. Now add the drained poha and mix well. Check for salt. Add if needed. Garnish with coriander leaves and enjoy hot tomato poha for breakfast or dinner or as a snack. If you are a poha/aval lover, find more Easy Poha Recipes. Thank u for sharing the recipe.